Calcium is a mineral naturally found in foods. 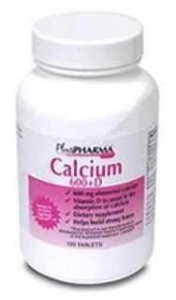 Calcium is necessary for many normal functions of the body, especially bone formation and maintenance. Calcium can also bind to other minerals (such as phosphate) and aid in their removal from the body. *This product is not manufactured or distributed by Whitehall-Robins Healthcare, owner of the registered trademark Caltrate®. Take 1 or 2 TABLETS daily with water, as a dietary supplement or as directed by a doctor. Croscarmellose sodium, sodium lauryl sulfate, hydroxypropyl methylcellulose, magnesium stearate, titanium dioxide, FD&C yellow #6, propylene glycol, triacetin, maltodextrin.